The Waterways Council has issued a Call to Action, and that action affects the Port of New Orleans. Your Help is Needed. Tell the U.S. Army Corps You Support Replacing the Inner Harbor Navigation Canal Lock in New Orleans. We need your help now by sending the U.S. Army Corps of Engineers your opinion. The New Orleans district is seeking public input as it considers options for the Inner Harbor Navigation Canal Lock. 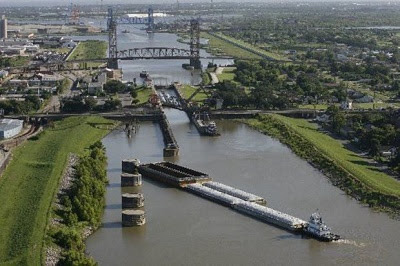 The lock opened in 1923 and connects the Mississippi River to the Gulf Intracoastal Waterway, the nation's two highest-tonnage waterways. One option, "Plan 3" includes replacing the existing lock. The proposed lock design would facilitate fewer trips through a safer, more efficient structure. This would reduce maintenance costs to the nation, decrease traffic congestion from bridge openings, lessen the number of barges waiting in queue near the lock, diminish noise for surrounding neighborhoods, and increase air quality. With a strong benefit-to-cost ratio of 4.78 to 1, constructing this new lock is a wise investment.